A new beginning in Crested Butte, Colorado. A carnivorous plant on Skid Row. A chance meeting in a Moscow cafe. And, a fresh look at Jane Austen’s beloved Elizabeth and Mr. Darcy. The 2015-16 theatre season of the University of Notre Dame’s Department of Film, Television, and Theatre (FTT) offers four distinctly different productions—Wildflower, Little Shop of Horrors, The Bear and Afterplay, and Pride and Prejudice—which together make this season one not to be missed, said Associate Professor Kevin Dreyer, director of the theatre concentration. 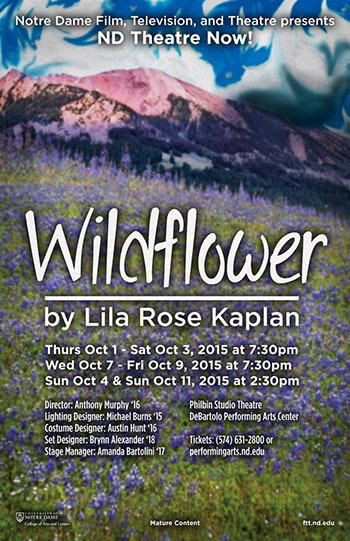 The season opens on Oct. 1 with Wildflower by Lila Rose Kaplan, the story of a mother and her teenage son starting over—and each discovering romance—in a small town in Colorado, home to the Wildflower Festival. Directed by senior Anthony Murphy, Wildflower is part of the ND Theatre NOW series, which allows students to take on roles typically handled by professionals—designing, directing, and producing a show themselves. An FTT major with a minor in business economics, Murphy said that while he’s been involved in theatre since he was a child, he is especially enjoying his time in the director’s chair at Notre Dame. In addition to Wildflower, Murphy directed last year’s ND Theatre NOW production of Out of Orbit, as well as plays for PEMCo, the largest student-run musical theatre company on campus. Murphy, who played the emcee in the 2013 FTT production of Cabaret, is also looking forward to the season’s production of Little Shop of Horrors—and plans to audition for the show. Cabaret was the first full-scale musical to be produced by the department in more than two decades. The extremely positive response to that show—both on campus and throughout the community—inspired the faculty to include musicals in the FTT season every two to three years. Professional director and choreographer Nathan Halvorson, who first came to Notre Dame to direct Cabaret, will return to direct Little Shop of Horrors. Little Shop of Horrors, by Howard Ashman with music by Alan Menken, tells the story of Seymour, an unlucky employee in a rundown floral shop on Skid Row who finds his chance at fame and happiness in the arrival of a mysterious, bloodthirsty plant. In February, the department will present The Bear and Afterplay, two comic one-act plays by Irish dramatist Brian Friel, based on the works of Anton Chekhov. The Bear is an adaptation of Chekhov’s early farce of the same name. Afterplay, set in 1920s Moscow, imagines a world where characters from different Chekhov plays—Sonya from Uncle Vanya and Andrey from The Three Sisters—happen to meet in a cafe, 20 years after their original stories. The season will culminate in April with Jane Austen’s Pride and Prejudice. The 2007 stage adaptation by Jon Jory is a choice Dreyer believes will have broad appeal. Dreyer also plans to collaborate with the DeBartolo Performing Arts Center on a film series celebrating Jane Austen, in conjunction with the production. Originally published by Carrie Gates at al.nd.edu on October 01, 2015.